Reduce down time by keeping your equipment up and running. 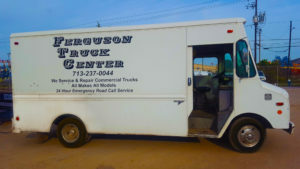 Ferguson Truck Center Onsite Mobile Truck Repair gets the job done. You call. We come. We perform repairs and common maintenance in your lot saving money and cutting down-time. We understand the value of keeping your fleet rolling, therefore Ferguson’s Onsite Mobile Repair trucks arrive equipped to get the job done, because carrying state-of-the-art technology and stocked with parts for standard repairs helps us serve you more efficiently. Now, if a repair cannot be completed on site, we can arrange for towing to our location. Why Choose Ferguson Mobile On-Site Truck Repair? Forget time wasted getting your equipment to us. We come to you, saving time. After all, if time is money, down time is even more expensive. Mobile on-site truck repair can get you rolling faster. You know and trust Ferguson Truck Center mechanics. What’s better, because they know your truck, our mechanics uniquely qualified to get your equipment back in service promptly. Mobile On-Site Truck Repair is like a house call for your equipment. Breakdowns and on-going service are just facts of life when managing a fleet. As a result, Ferguson’s Mobile On-Site Truck Repairs help make them easier on your schedule and budget.